There will be some streets closed and public transport is limited. Celebrations in Dublin in 2012. 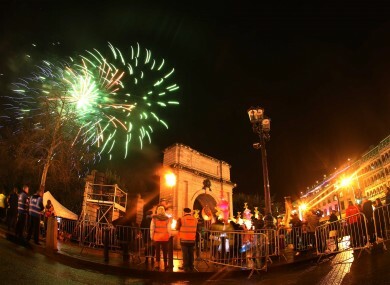 REVELLERS WILL DESCEND upon cities and towns across the country tonight to see out 2014. Gardaí say that New Year’s Eve is usually a busy night for them, but they say that there is no specific appeal this year, aside from asking people to use public transport where possible. In Dublin, bus, train and Luas services will all be operating a Saturday service until around 10pm, with Coastal and City tour buses running as normal. The Ghostbus will not run. Public transport will, however, have late services to get partygoers home. Dublin Bus will run a normal weekend Nitelink service, the Green Luas line will have late trams on the half hour from 1am until 3.30am. Iarnród Éireann will run normal services on some routes across the country, but most routes will end early. In Dublin, commuter trains will have special late services on all lines. The festivities in Dublin, where the New Year’s Festival is taking place, mean that Dame Street is closed to traffic all day. The area from Christchurch to Trinity College will be at the centre of the festival. On Leeside, last buses leave the city centre at 9pm, with some services ending earlier. If you’re heading out, Jack Lukeman’s Phantasmagorical show is in the Everyman Palace and Mick Flannery is the Opera House. Tralee will see in the New Year with a fireworks display and festival, while Portmagee will see out the Old Year, with a man dress as the old year leading a parade before a shot rings out and a younger man takes over at midnight. Limerick bus services will finish at 9pm. The last departures on the 602 sand 602 routes will be at 8pm, with the last 605 bus leaving at 7.35pm. Last buses in Galway leave between 8pm and 9pm. What are you up to? Let us know in the comments. Email “Celebrating New Year's tonight? Here's what you need to know”. Feedback on “Celebrating New Year's tonight? Here's what you need to know”.